Affordable privacy screen for your pool enclosure or lanai screen. Florida Glass Screen by Phifer in Naples, Marco Island, Bonita, Estero, Cape Coral & Fort Myers. Fast screen replacement. Complete wall rescreening or just a single panel. We offer Phifer Vinyl Florida Glass screen or one of the specialty screens available. No-See-Um screen, Super Screen & Pet Screen. Keep out dirt, dust, rain splash & sprinkler spray from your Lanai or Pool enclosure. 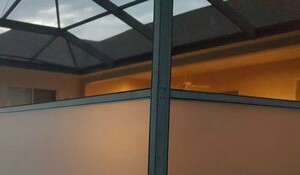 Waterproof opaque screen known as Florida Glass can be used as privacy screen to block a view or bad neighbor. Arrow is proud of our organization, its excellent reputation, and its philosophy to provide full service and satisfaction to every customer. 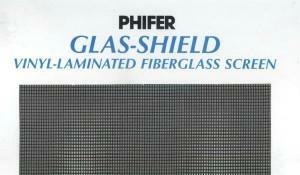 Quality Phifer Florida Glass 18x14 Screen at a price you can afford! Naples, Isles of Capri, Marco Island, Bonita Springs, Estero, Cape Coral, Lehigh Acres & Fort Myers. Dirt & Splash Be Gone!